Dr. Raval is the owner and medical director of the Rocky Mountain Laser Aesthetics. Get information on hair removal services at the Rocky Mountain Laser Aesthetics website. See how Juvederm® injectable gel can help to smooth wrinkles and folds and create a natural look and feel. View the Facial Assessment Tool. What would Barbie Do? – March 2009 marks Barbie’s 50th Birthday, and she looks as fabulous as ever. The favorite fashion doll was released in March 1959 and has changed careers over 100 times and changed clothes even more. ROCKY MOUNTAIN LASER AESTHETICS RAISES EYEBROWS, MAKING FOREHEADS YOUTHFUL AGAIN USING BOTOX® INJECTIONS – Denver, CO– Rocky Mountain Laser Aesthetics is raising eyebrows—literally. Called a chemical brow lift, the procedure in non-invasive, requires no downtime and shows immediate results. FDA approves a new treatment to boost eyelash volume – Finally, this is the first safe solution for having too few or too thin eyelashes, a recognized medical condition called hypotrichosis. Does he or doesn’t he? President Obama’s absence of frown lines is called ‘BOTOX® Optimism’ by the press – Beauty didn’t used to be a topic in serious business magazines like Forbes or the Wall Street Journal. Over the decades, the notion that youth is inextricably linked to the skill set enabling a great leader to tackle an all-consuming job such as president has gripped popular culture. Mystery of the neck: disbanded – Your neck is not a tree trunk; you should not be able to tell age by counting the rings. The circular bands around the neck that develop due to sun damage and loss of volume and elasticity in the skin reveals your age. 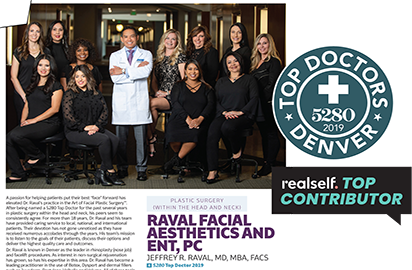 FACIAL PLASTIC SURGEON DR. JEFF RAVAL IS FEATURED REGULARLY ON COLORADO & CO. – Jeffrey Raval, MD, FACS appears regularly on Colorado & Company, a magazine-style segment broadcasted weekly on Channel 9 KUSA that highlights community events and leaders. NIX BOTOX®, NO WAY SAY THE MAJORITY OF AGING WOMEN – “Celebrity Buzz” in the Sunday, April 5, 2009 issue of online denverpost.com reports that Fleetwood Mac singer Stevie Nix’s shared her innermost beauty secrets with a throng of fans at an in-store appearance at a New York City Barnes and Noble. IMAGE IS EVERYTHING IN THE MIRROR, APPARENTLY – Beauty is not only skin deep. That’s only something the less blessed say to comfort themselves. The reason being, a person’s image is the way they see themselves. MAJOR AESTHETIC PROCEDURES MAY BE DOWN, BUT BOTOX® HOLDS RELATIVELY STABLE IN 2009 – The wrinkled look of safari-wear may be all the rage for Ralph Lauren in his Spring 2009 line, but women (and men) aren’t buying into the fact that economic down-sizing must mean that they have to suffer wrinkles on their face. Dr. Jeff Raval is the Nose Guy Among Surgeons in Denver – Rhinoplasty is the second most common facial plastic surgery procedure performed on more than 200,000 people a year. As the most defining characteristic of the face, a slight alteration can greatly improve one’s appearance. Finding Dr. Right – Just because your beautician liked the doctor who did her surgery is not a reason to abandon due diligence when searching for your own cosmetic surgeon. Laser Advancements – Laser Advancements mean more options and improved results.